Carefully measure your waist, hips and hip drop. The horizontal lines (1 to 2 and 3 to 4 in diagram below) will be HALF the hip measurement, the vertical lines (1 to 3 and 2 to 4) will be the length of the skirt (I like to make my base pattern 60 cms, plus 2 or 3 cms extra for a hemline). Take one QUARTER of your hip measurement and subtract 1 cm. This is where you will divide the rectangle with another vertical line (5 to 6). Mark your hip drop at point 7. The left side of the rectangle will be the base pattern for the back. The right side will be the base pattern for the front. Point 8 to 9: Calculate 1 quarter of the waist measurement and add 2 cms. With a straight ruler mark that measurement with a dotted line. Then connect points 8 and 9 with a very slight curve (you will draw it freehand). Point 12: Mark the middle point on line 8 to 9. Point 13: Using a square ruler against the dotted line, mark down about 9 cms. Now mark 1cm to either side of point 12 and connect both points to point 13. This will be a dart. Connect point 9 to point 7 with a dotted line. Mark the midpoint as point 14. Mark about .5 to .75 cm (using the square ruler against the dotted line) to the right side of point 14. This is point 15. Connect points 9, 15 and 7 with a slight curve. This curve is also drawn freehand. Point 2 to 16: Mark the line at 1.5 cms. Point 16 to 17: Calculate 1 quarter of the waist measurement and add 3 cms. With a straight ruler mark that measurement with a dotted line. Then connect points 16 and 17 with a very slight curve (you will draw it freehand). Point 18: Mark the midpoint between points 16 and 17. Point 19: Measure about 9 cms down from point 18 using a square ruler. Mark 1 cm to either side of point 18 and connect both points to point 19, forming a dart. Draw a dotted line between points 17 and 7. Mark the midpoint as point 20. Mark about .5 to .75 cm (using the square ruler against the dotted line) to the left side of point 20. This is point 21. Connect points 17, 21 and 7 with a slight curve. Cut out this pattern and trace it onto a new piece of paper. Modify the skirt pattern according to the type of skirt you are making. Add the seam allowances to the edges. 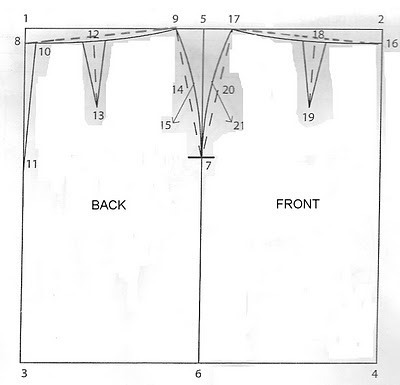 This will be your cutting pattern, the one you use as a guide to cut your fabric. Watch the video for a demonstration.